An advanced template to create just about any apps for Android. Clean code, well-tested libraries and proven best practices are the necessary foundation of any high quality apps. Connect your apps to virtually a limitless number of content sources available online. Sky is truly the limit of what you can build. With Material Design, no matter what apps you build, and no matter how elaborate they are, your apps are going to look great. Developed with target set to Marshmallow, the latest of the Android sweetness, Generics is primed to take up the future. It’s Easy To Make Your Own App For Android. Generics is an advanced multipurpose app template for Android, designed to be easy to use, simple to customize, and painless to extend. It’s architecture is engineered to help developers build robust, high-performance and adaptable template that you can refashion to create just about any apps for Android with ease. Whether apps for your favorite music band, delicious recipes and cookbook, trustworthy news sources, or apps for business, Generics can definitely help you start better and finish faster. 4 Screen Modules, 16 Individual Screens, Limitless Possibilities. Generics includes 4 screen modules with over 16 individual screens for starter. You can reuse every screen with different contents to build up your apps. Just imagine the amount of possibilities to create unique apps just by mashing up the screens with unique contents. But that’s just a beginning. If you need new kind of screens for your specific contents, just modify existing screens or easily create new ones by making use of the template’s solid framework, saving precious development time by allowing you to focus on your apps features instead of creating tedious boilerplates. Don’t Just Create An App. Create High-Quality Apps. Generics is built upon a foundation of proven best practices, standard design patterns, and battle-tested libraries as part of its architecture. These libraries and patterns have been and still are being used by many thousands of real-world high-volume applications around the world by reputable companies. We believe that relying on these libraries and design patterns in architecting Generics will only benefits developers who want to create robust, reliable and scalable apps that deliver high-end mobile experience for the users. Android Support Library: appcompat, design, recycler-view, cardview, annotations, multidex. Android-Easy-Cache: provide a cache with 2 layers, one in RAM in top of one disk. Admob Ads: for easy monetization. DroidUX: high-quality Android UI component libraries. EventBus: simplifies communication between Activities, Fragments, Threads, Services, etc. Facebook SDK: the official Facebook SDK used to integrate Android apps with Facebook Platform. FragmentArgs: Annotation Processor for setting arguments in android fragments. Glide: an image loading and caching library. 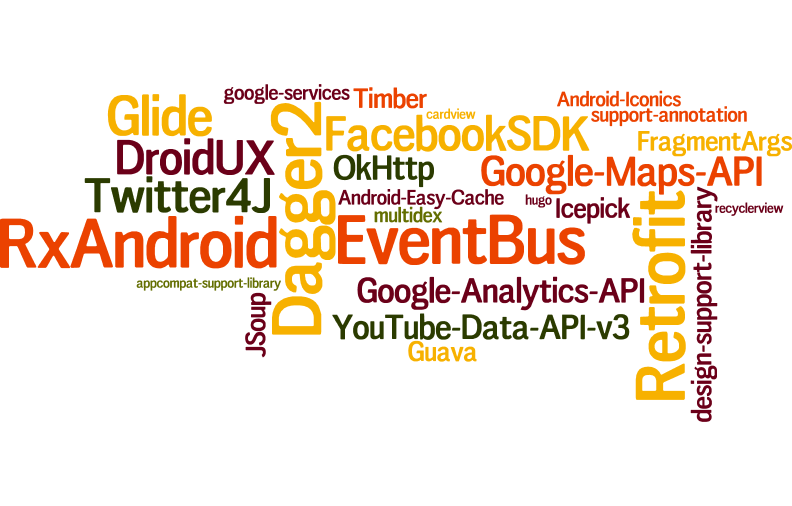 Google APIs : Maps API, Youtube Data API, Analytics, Mobile Ads (Admob), etc. Icepick: Android Instance State made easy. Loading-Content-Error: UI pattern to display views for different states. Model-View-Presenter: a software architectural pattern for implementing user interfaces. Retrofit: a type-safe HTTP client. RxAndroid: reactive/async library for Android. twitter4j: unofficial Java library for the Twitter API. YouTube Data API v3: add a variety of YouTube features. Out-of-the-box Generics allows you to easily connect to content sources through variety of channels, including Atom/RSS, web content, and REST APIs. This gives you practically limitless numbers of sources of contents available online. The demo app shows how you can effortlessly get the contents for your apps through the RSS feeds, web content using WebView with HTML5 video support, and via RESTful APIs from sources like Facebook, Twitter, Instagram, Maps, and YouTube. If that’s not enough for you, don’t worry. We’ll be adding new content sources in the future. But you don’t have to wait for us. You can easily connect to your own sources by extending the template with your own implementations. Generics is designed following the Material Design guideline, the new design language from Google. It communicates beauty and meaning through color, space, typography and simplicity. Combined with the fluid and intuitive user interface, no matter what apps you build, and no matter how intricate they are, one thing is for sure, they are going to look great. Generics is out-of-the-box integrated with Admob, Google’s mobile advertising platform, for your apps monetization. Admob is one of, if not the, most popular advertising platform used by many thousands of app developers to promote and monetize hundreds of thousands of apps. We’re planning to add integrations with more advertising platforms in the future. However, with Generics, it’s easy to plug your own integration. Included in the package is a detailed step-by-step instructions, complete with pictures, on how you can easily use the template to create your own apps. The documentation is written to help even those who are new to Android development. For those with a little bit experience in creating apps for Android, using this template is a complete breeze. And if you still have more questions, you can always contact us through our support system. The template includes features that should function as designed and might be enough for most use cases. However, the template is meant more as a bootstrap to jumpstart your developments for specific apps that might include the features implemented in the template. If you want to publish to Play Store (Google’s or any other Android app stores out there), you may not publish this template “as is” as your app. You must made the required modifications before you may publish it. For more information, please read the template’s documentation as to what customizations you’re required to make before using this template for publishing in app stores. With so many libraries used in this template, how about the "DEX 65K Limit" problem and the release APK size? This template is configured with multidex support enabled, and the Proguard settings configured to shrink and remove unused codes, including for all the libraries used by the template. The APK size of demo app is around 4MB, which is still an acceptable size for modern applications. For more information on the “DEX 65K limit” problem, please read the “Building Apps with Over 65K Methods” at the Android Developer website.